Just joined today. Bought my first Ranger 2 weeks ago. 2001 XLT 2.3L 5spd 2wd single cab stepside. That's a good lookin truck! You'll love the 2.3l, it's a great engine. For anyone saying it's slow as all get out, it's not really. It's still a 4 cylinder and still a truck, but it's got a little zip to it in the higher rpms. Welcome to F-R! Thanks, not too concerned about speed or power, that's what my GTI is for . Mostly got it for winter use/daily driving to/from work and hauling stuff. It's a lot nicer now that it's detailed outside. Inside is my focus this weekend. Seats and door panels are trashed and the drivers side seat belt doesn't retract so I'm hitting the local salvage yards for replacements and upgrades hopefully. I was just explaining to my wife the other day that I finally figured out why I was attracted to owning my old 93 Ranger. After all, I've been tinkering on it non-stop since I bought it back in March of this year trying to get all the worn parts quirks out of it! I said...these old Rangers are kinda like VW Bugs were back when I was in High School...they were friggin everywhere and parts were dirt cheap. So back then they were a tinkerers dream! Rangers now are like Bugs were then....they're are all over the craigslist ads and the junkyards are full of them. Pretty much anything you need can be found dirt cheap. Besides, its kind of addicting and fun treasure hunting, lol. Thanks! Yea that's one of the things that attracted me to the Ranger is that, because of their popularity, parts are readily available and not too pricey. welcome!! Rangers are awesome! I personally like the 2.3L trucks, for a 4 banger its a good one.....zippy and good MPG, reliable as a Vdub!! Ron, welcome to F-R. I checked all over the internet & with LMC Truck & it seems no one makes a full floor piece for the Rangers just the patch panels. Hello Dave, welcome to F-R. 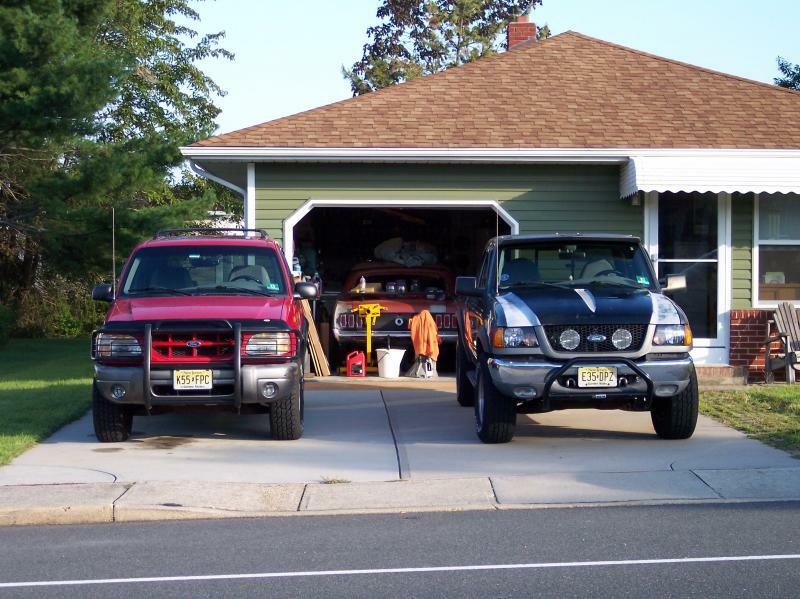 I am driving my 3rd Ranger, & my wife is driving her 3rd Explorer Sport. Hey, glad you came to check it out here!!! Once these guys see how far you've come making your ranger out of 2trucks in 2 years they will be impressed!!! Hello Dave, I am a Rangerholic too ! I hadn't read your Intro when I posted to your thread. Also, what is an "R-140 Model" ? the "R-140" is my own made-up model designation, since this was turning into a 70's tribute truck and i had moved the ranger nameplate to the back upper bedside, i needed something on the front fender where the ranger emblem had been. the 74-76 full size trucks had whatever they were there, such as "F-150". i figured id go with "R" for ranger, and 140 for engine displacement. (2.3/140 c.i.d.) plus 140 is a little less than 150 and its not quite a 1/2 ton truck. i thought about "R-50" but dodge used that once upon a time with there D-50 model compact trucks ( that were really made by mitsubishi ) just call it my own personal customazation. its certianally one of a kind. Everyone has a reason for their naming things. Never did it except for one vehicle, and that's another story. Page processed in 0.2234 seconds (18% database + 82% PHP). 87 queries executed.